When running certain applications you are limited to your default backlight time out of just a few seconds. Ever wanted to way to just leave the backlight on? Using Google Maps for navigation and the screen keeps turning off? Leave It On is the solution for you. Now with animated Pop-up Alerts! Its 2 apps in 1. Pop-ups will notify you of new messages and clicking will launch the application. 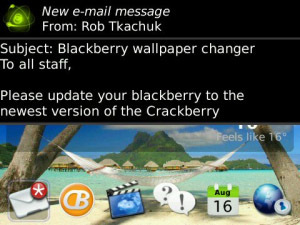 Leave It On will change the way you use your BlackBerry® device! Built-in pop-up/backlight support for: AIM, BBM, Beejive, Blaq, Cnectd e-mail, Facebook, BBM Groups, GTalk, Gmail, Google Voice, ICQ, IM+, Issimo, LogicMail, ScoreMobile, Skype, SocialScope, SMS, Trillian, Twitter for BlackBerry®, UberSocial, WhatsApp, WLM, Yahoo and more. E-mails and SMS now support full message preview! Emails can be marked as read, replied, forwarded and deleted right from the pop-up! Please Note: A reboot (battery pull or soft reset) may be required after 1st installation. -Leave the backlight on automatically for up to 8 applications. Just launch the application and Leave It On will automatically keep the backlight on for you. -Keep the backlight on while charging, through USB, car charger or regular charger. -Set how long to keep the backlight on for, settings from 1 minute to 2 hours or never.